Following a recent upgrade of the heating, ventilation and air conditioning system in the special collections storage facilities at NYAM, the Gladys Brooks Book & Paper Conservation Laboratory received a group of artifacts associated with George Washington for stabilization: (1) a plaster-cast facsimile of George Washington’s lower denture (the original, which is made of hippopotamus ivory, is currently on loan to Mount Vernon through June of 2013), and (2) a collection of dental tools (constructed out of hand-forged metal and bone and/or ivory) made and used by Washington’s dentist, Dr. John Greenwood (1760 – 1819). Proper housing is an important element in the overall preservation of any artifact. By protecting objects from improper handling and adverse environmental conditions (including light, water, dust, and pollutants), boxes and other types of protective enclosures — especially when made using pH neutral and chemically inert materials – can add decades to the life of an artifact. 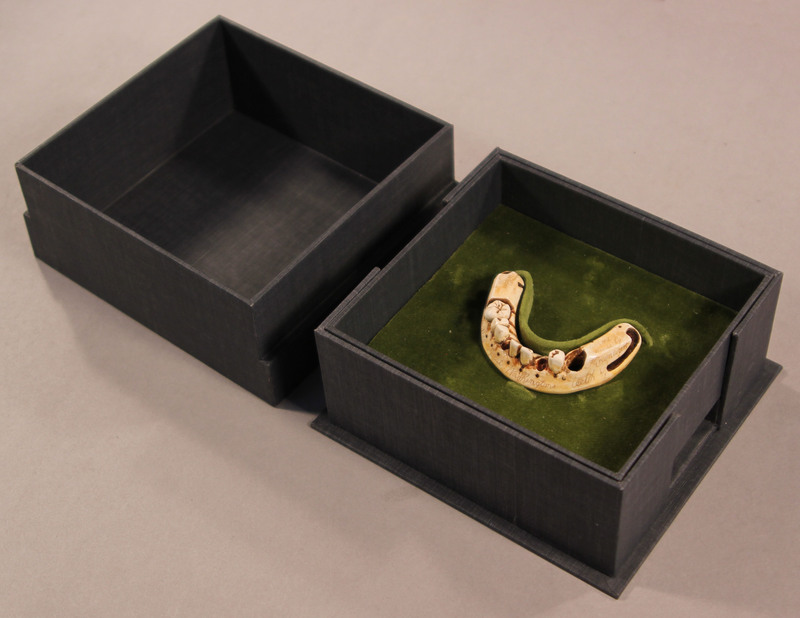 In this case, the conservator’s custom-made boxes allow for easy access and display of the objects during tours and exhibitions. Interior trays easily lift out of the structural exterior boxes, preventing the need to touch the objects themselves. If you take a close look at the denture, you will see engravings. They were made by Dr. Greenwood and read: “This was Great Washingtons Teeth” and “First one made by J. Greenwood,” accompanied by the date 1789. Several of the tools also carry an engraved message (albeit a slightly more ominous one): ”[D]on’t touch these instruments.” Thanks to their new box, it is now easy to honor Dr. Greenwood’s wish! 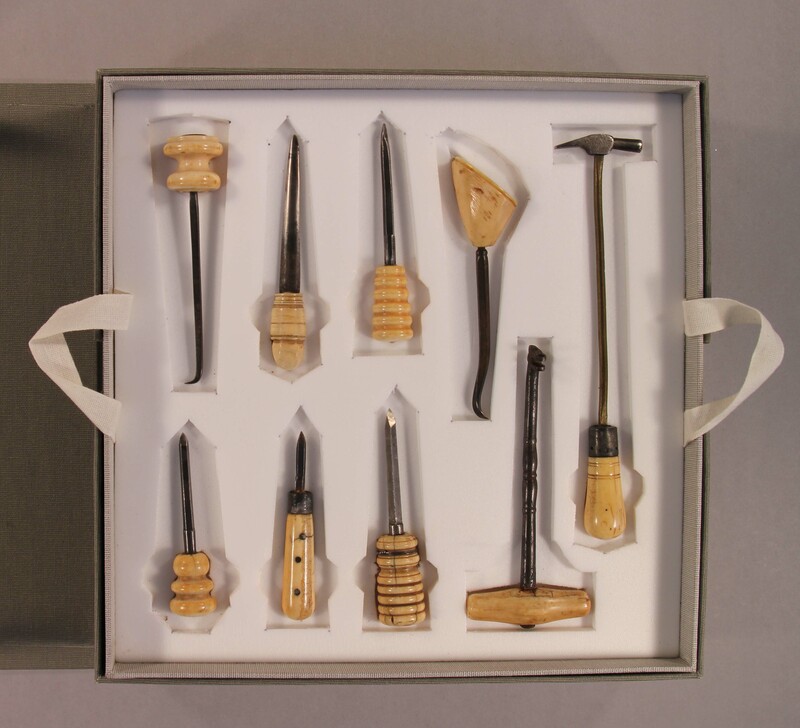 The tools and the denture facsimile are all beautifully made and are now securely housed and preserved among NYAM’s special collections. You can arrange for a tour to see the Drs. Barry and Bobbi Coller Rare Book Reading Room and some of NYAM’s many treasures by contacting history@nyam.org. This entry was posted in Collections, Conservation and tagged Artifacts, conservation and preservation, George Washington by allisonpiazzanyc. Bookmark the permalink.